Today's review is a bit unusual for me, as I haven't reviewed a Marvel Comics toy in ages. I spent about a year loving Marvel when I was 13-14, then my second Transformers era took hold and I didn't get interested in Marvel again until the time of Marvel Legends. However, I did always have a certain fondness for the subject of today's review, USAgent. 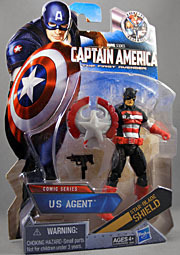 USAgent is armed with a Vibranium shield very similar to that of Captain America. He uses this for protection and as a weapon. Although he and Captain America have had their differences, both agree that any threat to justice and freedom must be stopped. 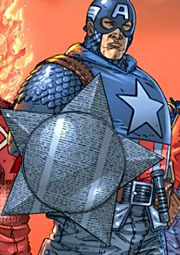 I'm not sure why I liked him - maybe it was because I found the real Captain America a bit dorky. USAgent, to the young teenage Poe, was the "cool" version of Cap; plus he had a more interesting costume. If I'm being honest, I didn't really know who USAgent was - I just liked the character concept, and the look. In retrospect, of course, the character was kind of Azrael to Captain American's Batman - a more brutal, less idealistic, and generally darker replacement (though I should note that the Cap-replacement storyline took place in the late '80s, years before "Knightfall"). Anyway, it was that mild nostalgia that led me to make my first Marvel Universe purchase since my last and heretofore only one, brown costume Wolverine. We never got a Marvel Legends USAgent, so when I saw this one I just couldn't resist. I don't follow Marvel Universe or its movie-based sublines, but there appear to be two three types of figures in their Captain America: The First Avenger line: the "movie series" consisting of figures from and inspired by the upcoming film; the "comic series" featuring characters from Cap's "extended family," so to speak; and the "concept" line, which features Cap in outfits Super Dave Osborne wouldn't be caught dead in, like X-treme Snowboard Cap or whatever. The art on the packaging is eye-catching and the blue and red color scheme is always a winner. I can't help but note the "Avengers Assemble" logo in the upper right corner - Marvel is pushing this Avengers thing hard, aren't they? 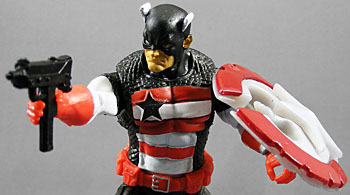 I don't own any other MU Captain America figures, but I assumed this figure would be built primarily from existing Cap parts. However, that's not really the case. 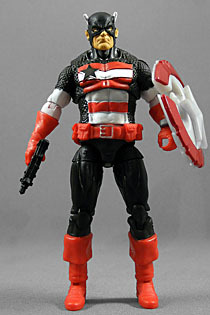 Yes, they're shared with the "International Patriots" Captain America, but he was a repaint of this figure. And of course the chest, with its banner and star, is new, as is the head. It's a good sculpt for the scale. Hasbro has gotten about as good as they can get in the 3¾" scale without becoming a Japanese company. Since I don't collect a lot of 3¾" scale stuff, I have a hard time judging the quality of the paint applications. It's more difficult to get intricate details right on a figure this size, but that doesn't excuse the uneven lines on the star on his chest. It's an utter mess, and you'll have quite a search ahead of you to find one that's acceptable. Even more disappointing is the lack of any sort of wash or detail on his gloves, boots, and belt, which are molded in bright red and as a result, look very toyish. We know these are the "comic" based toys, but that doesn't mean they have to be painted in four colors - they're comic-based, but not cartoon-based. After what we've seen from Hasbro on other lines, including Marvel Universe, there just seems to be a bit of a lack of effort here. USAgent has a balljointed head, swivel-and-hinge joints at the shoulders and elbows, a balljointed abdomen, balljointed hips, swivels at the top of the thighs, double-hinges at the knees and hinges at the ankles. This is pretty good for the scale, though double-jointed elbows would be much more preferable to the much-maligned "elbrows." As usual for MU, the "balljointed" head has very little actual range of motion. It's a shame the figure lacks swivels at the wrists. 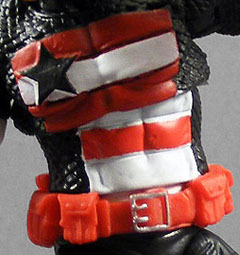 Also, note that despite the fact that it looks like the figure should have a swivel waist, it doesn't - that range of motion is only accomplished through the chest joint (seen above). The accessories include a MAC-10, which fits USAgent's more extreme brand of justice (right? or am I way out of the Marvel loop here?) but doesn't really fit his hand, since he doesn't have an extended trigger finger. He also comes with what the packaging describes as a "star-blade shield," but isn't. Nor is it the vibranium shield described in the bio. This shield has a star on it, but it's shaped like an eagle. At first I wasn't sure whether the character had actually ever wielded a shield like that, but apparently he has (while part of a group of former Guardsmen called "The Jury"). He has used a star-blade shield before, but that's different. The shield has a nice touch in that it has a swiveling attachment on the back that allows it to clip to his wrist or project a peg that can be used to stick it to his back. The red edges of the wings can also rotate out, either for a (slightly) wider protective surface, or perhaps as blades. I don't think this figure is going to convert me into a Marvel Universe collector, but it's nice to finally get a proper USAgent figure. With my strong preference for the 6"-7" scale, I usually find all 4" figures disappointing, so I didn't judge this quite as harshly as I might have because my standards were already low.